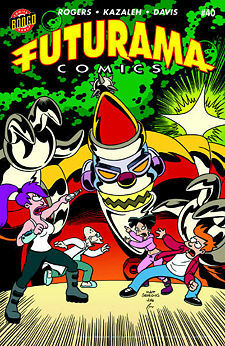 "Robot Santa's Little Helpers" is the fortieth comic issue, which was released 26 November, 2008 in the US. Bender visits a mall Santa to read off a long list of demands while Fry and Leela do their Xmas shopping. The mall Santa informs him that more Santas are needed, and given the various advantages he takes the job. After shopping, they return to work for another dangerous mission. There is a delivery to be made to Antler Stadium on Neptune. With Bender busy, Zoidberg fills in as the ship's chef because his cooking is equally bad. Bender enjoys his day insulting and assaulting people for money and booze. Meanwhile on the mission Zoidberg eats all of the food, causing Fry to use more curse words together than he ever has before and him and Leela to leave Zoidberg teary and feeling unwanted. Without any food available, Fry and Leela change their plan of air dropping the crate to hand delivering it and bartering for food. Zoidberg is told to stay put, but decides to leave in search of friends who value him for who he is. While wandering the planet, Zoidberg meets one of Santa's elves, who has run away in hopes of finding someone to help him heal the injured elves. Zoidberg suggests they open a hospital and the elf leads him to a camp. Here there are injured elves who have escaped from Santa. After completing the delivery, the crew notice Zoidberg is missing and head out to find him. Arriving at Santa's workshop, they see Santa and head elf Chauncey discussing the year's plan of controlling the mall Santas and having them attack anyone they see. Zoidberg has finished with his patients and the elf that brought him reveals that his actual plans have nothing to do with building a hospital and he was just using Zoidberg. Leela finds the remote to the mall Santas, but Santa appears and moments later, the healed elves and Zoidberg show up. Santa uses the remote causing Bender and the other Santas to attack people. Leela throws Fry's gift to her of candy-cane perfume at the remote, which Zoidberg eats, along with one of Santa's hands. The mall Santas return to normal. Suddenly, the elves attack Santa and the crew make their escape. Leela has designed a holo-pilot for the ship, which resembles an overweight, balding Amy with some kind of skin condition. Antler Stadium and Santa's Workshop are apparently on opposite sides of the planet, but the crew choose to walk from one to the other instead of using the ship. The UK releases have skipped this issue, it is unknown if it will be released there. The name is a reference to Santa's Little Helper from The Simpsons. Once again, the comic staff have forgotten that Sewer Mutants are not permited to come to the surface. In "The Series Has Landed", Leela was able to get the Planet Express Ship to the moon in less than 2 seconds. At the same speed, the ship should be able to get to Neptune in about 2 and a half hours, which is not long enough a time for food to become a large issue. Additionally, Bender is not the ship's cook anymore and now holds the position of "Assistant Manger of Sales". This is the job he apparently had in Bender's Big Score. 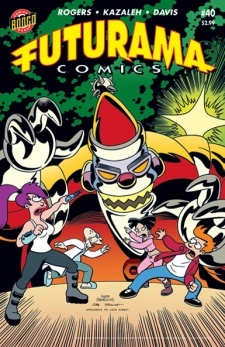 On the cover, the spikes on Robot Santa's pompom appear; however, they are absent throughout the comic. This page was last edited on 26 November 2013, at 18:02.